Did you know that the food and water you give your dog can make a difference in the severity of her Maltese tear stains? It's crucial to find a good, natural dog food. Maltese dogs can also benefit from purified water. Take a careful look at what you are feeding your Maltese. Read below to find out if what you are giving your dog is contributing to your Maltese eye stain. What Maltese tear stains solution worked for your dog? Tell us about it. The food your Maltese eats is very important. I only give my dogs Marley and Disco high quality, natural dry kibble. Other commercial dog foods contain alot of additives, preservatives or food color. 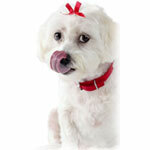 Beet pulp, which is in many commercial foods, can increase tear staining in Maltese dogs. Solution - Try a different kind of food for awhile to see if that has an affect on your Maltese tear staining. You can learn how to find the best puppy food for your dog or get pet food coupons from over 10 best dog food companies. If your local water has high mineral levels, this might be the cause of your dog's tear stains. Usually the whole face and beard are stained if this is the problem. Some plastic bowls can also cause discoloring of the face. A stainless steel bowl is best. Solution - Try giving your Maltese only bottled or purified water. I have always given my Maltese Marley filtered water from our refrigerator and she has very little tear staining. I also serve both her food and water in stainless steel bowls . Stainless steel slows bacteria growth and is easy to clean. Still have questions about Maltese tear stains? I've teamed up with a group of expert dog vets to help you find the answer.